How to Use Ravan for Password Cracking? In my previous article, i explained about the Ravan Tool. Now let us see how to use the Ravan for cracking passwords. 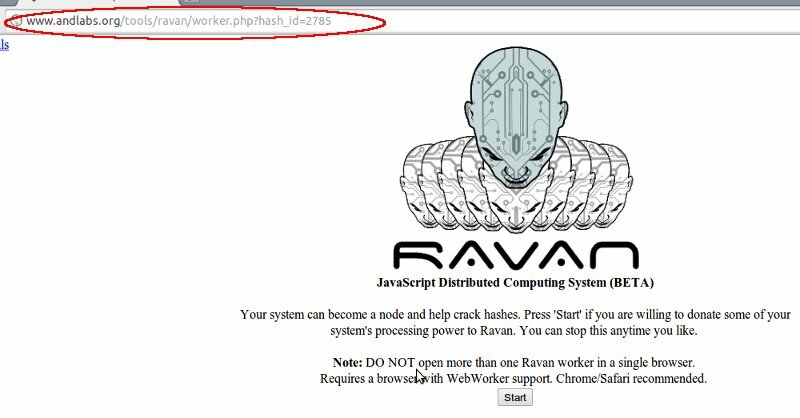 Ravan is Distributed password cracking method. So you will need lot of friends who have Pc with Internet connection. The speed of cracking will increase based on the number of pc contribute in the cracking. If hash is successfully submitted, it would return a URL. Now you just need to send this URL to all your friends and ask them to click the start button. The main page manages the cracking so it must not be closed or the cracking would fail. That is it. Once your friends click start they would be doing pieces of the work and submitting results back. The main page would constantly monitor the progress of the cracking process and manage it across all the workers. You would be able to see the stats throughout the process, once the hash is cracked the clear-text value is displayed.